It’s pouring outside. Inside, it’s humid and warm, rain slowly evaporating from people’s coats and hair. The bar is half empty. I gather that a few other invited guests succumbed to the inertia of autumn and the gravity of their living rooms. Autumn is the season of memory. The sight of leaves dropping, a cold, gray morning: every sensory experience sends me spinning into circles of nostalgia. I live more in the past than in the present, tripping over the reflections of my former selves. I’ve been lured out into the wet weather by a random email from Jim Beam’s PR people. It’s the first time I’ve been sought out and invited to an event. 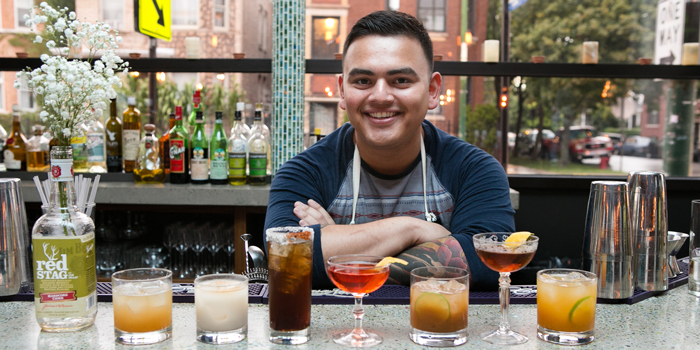 Jim Beam partnered with Jonathan Zaragoza, chef at Masa Azul, to promote their cider-flavored bourbon during Latino Heritage Month, making cocktails and pairing it with specially cooked dishes. 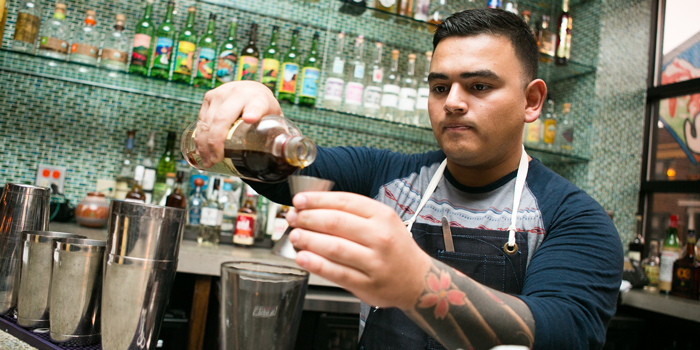 A Jim Beam public relations acolyte-for-hire deftly secures my dripping umbrella and promises to introduce me to Masa Azul’s chef, Jonathan Zaragoza. Jim Beam’s new apple-infused Red Stag bourbon has a place of honor at the bar, displayed next to its other flavored brethren: honey tea, black cherry and “spiced” (Insert a nerdy Dune reference here, if you like). I drank a lot of Jim Beam in my early twenties. The taste of it brings me back to the years I spent in Colorado, drinking bourbon-whiskey straight from the bottle on mountaintops underneath pale half-moons. It’s a shortcut to a time in my life that was full of confusion, passion, identity crises, inappropriate crushes, sexual misadventures, all-night conversations with friends, angst, poetry. Every moment felt pregnant with potential. I was on my own in the world, and it felt wide and new and strange. Proust had his madeleine and tea. I have flavored bourbon and falling leaves. “Would you like a drink?” a Jim Beam huckster asks me. “Please,” I reply. Maybe booze will make me feel like I’m actually an adult instead of a kid playing dress-up. It certainly used to have that effect, back when I drank it as a minor. Proust used the term “involuntary memories” for when sensory experiences lead to insights to the past. Lynda Barry, in her fantastic book What It Is, explores the medium of memory through the use of collage and writing. Strange creatures populate her art: birds, fish, cephalopods and ghosts swim in the margins and perch on the shoulders of her “essay questions.” What is a memory? Where does it reside before we remember it? Where is the past? Why do we call it a “flood of memories”? When I was still living in Colorado, I had nightmares about floods. This was in 2005–the same year I was photographed dressed as a pirate and proudly holding a handle of Jim Beam, with the caption “Captain Nicole and her First Mate”–and only a few months after Hurricane Katrina. I lived in an apartment complex only a dozen yards from Boulder Creek. I spent the summer sleeping on my balcony, and the water had a tendency to invade my dreams. One morning, half-asleep, I heard a roaring. I figured it was a flash flood, the big one that the newspapers had been discussing during a particularly slow news cycle that summer. I was on the second floor and assumed I’d wake up to see the parking lot below my balcony flooded. In my dreams, like in Barry’s multi-layered paintings, strange, sinuous creatures swam through the muddy waters. When I woke up that morning, the parking lot was dry. It had been the garbage trucks that had invaded my sleep, the groaning of their engines, the crash and clangs of dumpster lids. Eventually, Zaragoza calls us to our tables to start the courses. Each dish is served with an accompanying cocktail, made using the Jim Beam’s Red Stag, a new apple-flavor-infused bourbon that the company is debuting this season. Not to bite the hand that is literally feeding me, but Red Stag isn’t my thing. Infused with apple flavor, the liquor verges dangerously close to syrupy sweetness. The cocktails that are served that night are almost treacly, the exception being a relatively restrained hard horchata. The food, on the other hand, is lovely. None of it is very edgy or experimental. It’s comfort food. Chicken with mole sauce, frijoles borrachos, churro donuts with chocolate sauce, tres leche cake. The frijoles borrachos are from Chef Zaragoza’s grandmother’s recipe. The cocktail accompanying the mole chicken wings is named after his father. Nostalgia is the theme of the night, just like it’s the theme of the season. I talk with my tablemate, Brenda Storch of LaVitaminaT.com, about the blending of cultures happening here. Apples and autumn and ugly sweaters and foliage and returning to school and pumpkins and corn mazes: a concept and accompanying flavor that’s uniquely North American, despite the fact that it’s currently trying to reach a demographic with origins south of the border. 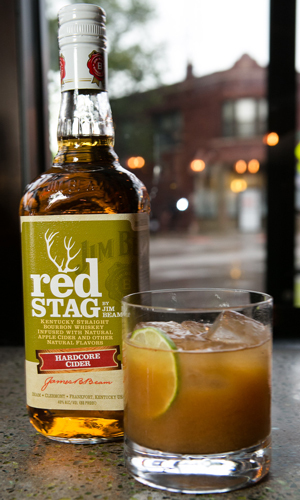 The Red Stag doesn’t taste so much like cider as apple candy, a sweeter version of the real thing. Nostalgia in bottled form. If I were younger, I think I would like it more. I started experimenting with alcohol at twelve, and–aside from one memorable evening that began with shots of bottom-shelf vodka and ended with five preteen girls all crying hysterically in a basement–I drank sweet malted alcohols and liqueurs until I was eighteen and traveled to Scotland, where my love of whisky was born. And even after that, I still downed flavored shots and Bailey’s on ice and White Russians, chased shots of rum with lime Budweiser and topped the whole thing off with a handful of Double-Stuf Oreos and a clove cigarette. I craved sweetness and kindness, the simplicity of saccharin. I manage to snag the chef before I leave and tell him I have two questions for him. I’m full from four different courses and six cocktails, the last of which tasted vaguely like cough syrup. I ask him about nostalgia first, spitting out a stream of not-quite-sensical words at him. He says that food should be a happy memory. Cooking and eating create new memories and take old ones back as well. He mentions the inspiration he feels from his mother and grandfather, both of whom he talked about earlier. Then he asks me what my other question was. “I think you answered it,” I say, after a pause. I’ve actually forgotten what it was. I haven’t taken any notes on what he just told me either, and I’m already starting to lose the thread of our conversation. It’s time to leave. I shake his hand, collect my umbrella and say goodbye to the same friendly face I began my night with. She hands me a box of Red Stag swag to take with me. Stag-Swag, I sing to myself outside. Swag-Stag. Stwag. My phone is full of self-pity, interspersed with details about the food: Churros are more like beignets. Angels sing when I split one open with my teeth. Reminds me of fried dough at the county fair, cider donuts with hot chocolate in winter, baked donuts from that stoner place in Boulder. I feel old and diminished and pathetic. Slight nuttiness to the chocolate sauce. Sensory experiences trigger memories. “Trigger” is odd phrasing, isn’t it? As though a memory were a weapon, an improvised bomb thrown into one’s path. The past intrudes on the present, no matter how far from it we travel. One memory sets off another, a chain of explosions. In an acting class, in my first few months in Colorado, I and my fellow students were asked to perform a small, unimportant, physical act. Drinking a cup of green tea. Washing a plate in the sink. Mine was reading a book. Then we were told not to make it a performance, but a re-enactment. It became a guided meditation, and I felt the weight of the book in my hand, the texture of its pages. In the same way that sugar is reduced from its natural components, boiled and purified, so is nostalgia reduced from memory. Colorado is a thousand miles and eight years removed from me. But this week, it seemed closer. I spent hours looking through photo albums on Instagram and DailyCamera.com, looking at the damage from its singular flood: washed out roads, houses shifted on their foundations, streets that had become rivers. I’ve checked: my old apartment was in the flood zone. My safe distance from Colorado, both in miles and years, shrank and then evaporated completely. I could feel the Astroturf that covered my balcony, the lumps in my cheap futon mattress, the stale smell of cigarettes from the ashtray. I could hear the water from Boulder Creek, swollen past its banks. I felt the eddies and vibrations of the strange creatures that swam beneath the surface of the flood, bumping against beams that held me above it.